The state of North Carolina offers a variety of contractors licenses. These include general and specialty licenses, electrical, landscape, and plumbing, heating and fire sprinkler licenses. The licensing process and requirements for any of these licenses vary because they are issued by different licensing bodies. For some licenses, such as the general, electrical and landscape contractors licenses there is a statewide requirement to obtain a North Carolina contractors license bond while for others, such as for plumbing or heating contractors, there are city requirements. Read on for more information on how to get any type of contractors license! The state of North Carolina issues various licenses for contractors, depending on the type of work they perform. Additionally, all of these licenses are issued for three different classifications – limited, intermediate, and unlimited – depending on the working capital of the contractor. These classifications allow contractors to work on projects that have a particular cost but not above that cost. 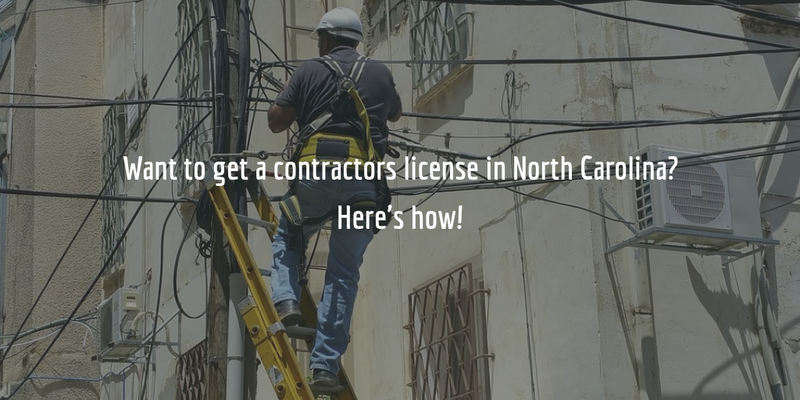 To obtain a North Carolina electrical contractors license you will need to apply at the State Board of Examiners of Electrical Contractors. The Board issues 10 classifications of electrical contractor licenses. These are the limited, intermediate and unlimited classifications that allow contractors to perform residential, commercial and industrial work on different scales. The Board further issues a license that permits work on single-family detached residential dwellings. Landscape contractor licenses in North Carolina are issued by the NC Landscape Contractors’ Licensing Board. The Board issues two types of licenses: individual and corporate. Finally, the state of North Carolina also issues licenses for plumbing, heating and fire sprinkler contractors, as well as fuel piping licenses. These are issued by the State Board of Examiners of Plumbing, Heating and Fire Sprinkler Contractors. There is a variety of licenses in each of these categories with the main distinctions between being that Class I licenses that cover systems for all types of buildings and Class II licenses which are limited to single-family detached dwellings only. To get any of the above licenses, applicants will need to apply at the respective State Board by submitting the application forms, passing a qualifying examination and, in some cases, submitting financial guarantees such as a surety bond. An exam is held by all types of contractor license applicants! When applying you will also be required to pay examination fees which differ from license type to license type. The licensing Board will notify you of the amount of the examination fee once you begin the application process. Once you pass your examination and your application is approved by the Board, you will be issued your North Carolina contractors license. If you will be applying for an electrical or landscape contractors license, see below for more information regarding the surety bond requirement. To get licensed, general, electrical and landscape contractors in North Carolina are required to obtain a surety bond. This is a statewide requirement that applies to all such contractors. Apart from this requirement, the cities of Winston-Salem and Greensboro also require certain applicants for a contractors license to get bonded. The bond requirements for all of the above license types are as follows. Electrical contractors who apply for intermediate and unlimited license classifications must provide a $50,000 bond for the former and a $130,000 bond for the latter. A $10,000 NC landscape contractor bond is required of all applicants for a landscape contractor license. A $2,000 surety bond is required of all applicants in the city of Greensboro for an electrical, plumbing, heating, air conditioning, mechanical, refrigeration, HVAC and concrete contractor license. Contractors who perform demolition, grading and house moving in the city, on the other hand, must post a $5,000 bond. In the city of Winston-Salem, heating and electrical contractors must post a $2,500 bond whereas street, bridge, and sidewalk contractors must post a $20,000 bond. The reason contractors are required to obtain a bond is in order to guarantee that they will comply with the state and city laws and regulations. If contractors violate these, a claim can be filed against the bond and claimants can be compensated for any damage or loss they experience due to such violations. Often bond amount and bond cost are confused, and people worry that they need to pay thousands of dollars to get bonded. The amount of the bond is not the same as the cost of the bond. The bond cost is a fraction, a small percentage of the full bond amount which you need to pay in order to get bonded. It is based on the personal credit score of the applicant – the higher the score, the lower the bond rate. For example, when you apply for the $50,000 electrical contractor bond, and are given a 1% rate on your bond, you will need to pay $500 to obtain the bond. Rates for high credit score applicants may vary depending on the bond type but are generally between 1% and 3% of the bond amount. Ready to apply for your contractor bond? Start by getting a free quote! For more information about the cost of your bond, feel free to call us at 877.514.5146 or simply complete the surety bond application form to receive an entirely free quote on your bond!